While we wait for the judges to reveal their picks for Flaunter Emerging 2018, we catch up with a few of last year’s promising designers to find out what they’ve been up to in the last 12 months. Today we chat to Rachael O’Brien who blew us away with her intricate designs and incredible photoshoot last year. Since then, Rachael has seen her brand OF RO on the runway at Virgin Australia Melbourne Fashion Festival (VAMFF) and St George NextGen, and on the pages of some impressive publications. Clearly, the fashion world is ready for Rachael, and we’re definitely here for it! HOW’S LIFE AFTER GRADUATION? ARE THERE ANY STANDOUT MOMENTS? Life’s been a whirlwind of excitement, opportunity and the unknown. After going through my crazy final year of uni, I was under false pretences that somehow the real world would be a slightly slower pace. Haha, how wrong I was. The opportunity to participate in VAMFF and St George NextGen at Mercedes-Benz Fashion Week Australia were standout moments. I felt so honoured to have the opportunity to explore my collection further and receive feedback from industry and community members alike. WHERE ARE YOU CURRENTLY WORKING? WHAT DOES YOUR DAY TO DAY LOOK LIKE? I’m currently working as a freelance designer assistant Monday to Friday and in retail on Saturday. The experience of my first design role for an Australian label has been eye-opening, challenging, fast-paced and an incredible opportunity. I’m working with so many talented, creative people and have a renewed admiration for every step of the design process. From designers to graphic artists, pattern makers, artisans, manufacturers, buyers and the marketing, sales and finance teams – you really see how important every individual is in building a great business and creating incredible designs. WAS THERE A DESIGNER OR ARTIST WHO INSPIRED YOU MOST TO BECOME AN ARTIST-DESIGNER YOURSELF? I can’t say there was ever anyone in particular who inspired me to pursue design. But here are some of my favourite artists and designers who continue to inspire me in work and life. WHAT’S THE ONE THING YOU WISH YOU COULD GO BACK & TELL YOURSELF ON YOUR FIRST DAY OF UNI? All the hard work will be worth it. WHAT HAS BEEN YOUR PROUDEST MOMENT OR A TIME YOU WERE PARTICULARLY EXCITED ABOUT SOMEONE WEARING YOUR DESIGNS SINCE GRADUATING? I loved seeing my collection come to life with a tribe of 10 models and MBFWA. 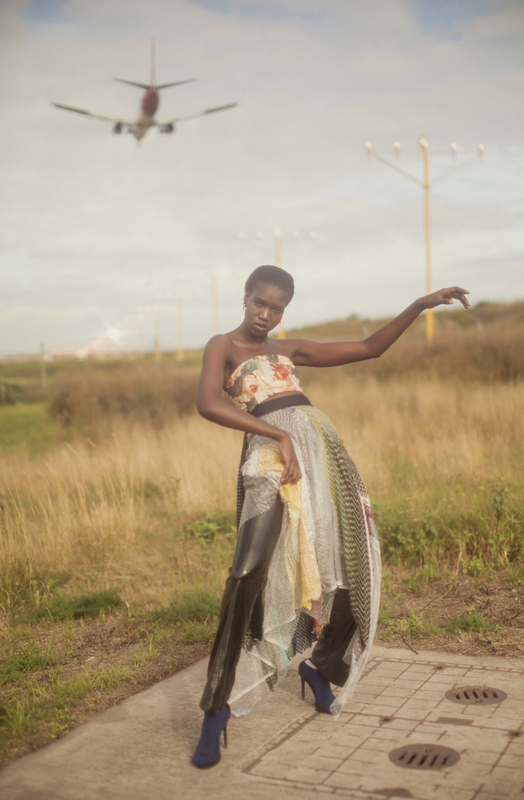 Also, the shoot for PAGEone Magazine (below) by Ahsatan Killeen and Paige Mary Grace featuring NyaLuak Let blew me away. I am always so inspired by the work done by stylists and photographers alike and love to see how they curate my garments. WHAT WAS YOUR EXPERIENCE WITH FLAUNTER EMERGING DESIGNER SHOWCASE? WHAT WAS THE BEST THING YOU GAINED FROM IT? Flaunter was an incredible platform to receive industry feedback and recognition so soon after graduating. The judges’ feedback shed new light and ideas on my work that I had perhaps been previously too close to recognise. I also loved being able to browse the Flaunter archives and discover the incredible work of other graduates. I can’t wait to see this year’s group of applicants. Right now, I’m loving working and learning within the industry. The near future will definitely involve travel. Hopefully with some international experience and collaborations. Creating and building on my own work is something I want to continue to pursue. There is not one prominent figure within the fashion industry that inspires me. My inspirations are continually changing and come from a range of people, places and ideas. WHAT WAS THE FIRST GARMENT YOU EVER MADE? When I was 14 I fell in love with an Elizabeth and James, navy velvet dress that I made to wear to a wedding. Subscribe to our blog to stay up to date with the Flaunter Emerging Designer Showcase.